Home > Opinion > Who is the man set to be Cambridge Analytica’s new boss? Who is the man set to be Cambridge Analytica’s new boss? The Wall Street Journal reported earlier this week that Julian Wheatland is set to replace the disgraced Alexander Nix as CEO of Cambridge Analytica. In the first of his investigations Liam O’Hare asks who is he? It’s a story of Airbus, Blackwater, Bell Pottinger and Bulgarian tech. However, rather than any fundamental change this appears to be mere cosmetic surgery to an organisation deeply embroiled in a series of scandals around data harvesting and election rigging. A quick examination of Wheatland’s history suggests this is little more than a case of “new boss, same as the old boss”. As first revealed by Bella Caledonia, until January 2017, Wheatland was the chair of the Oxford West and Abingdon Conservative Association. 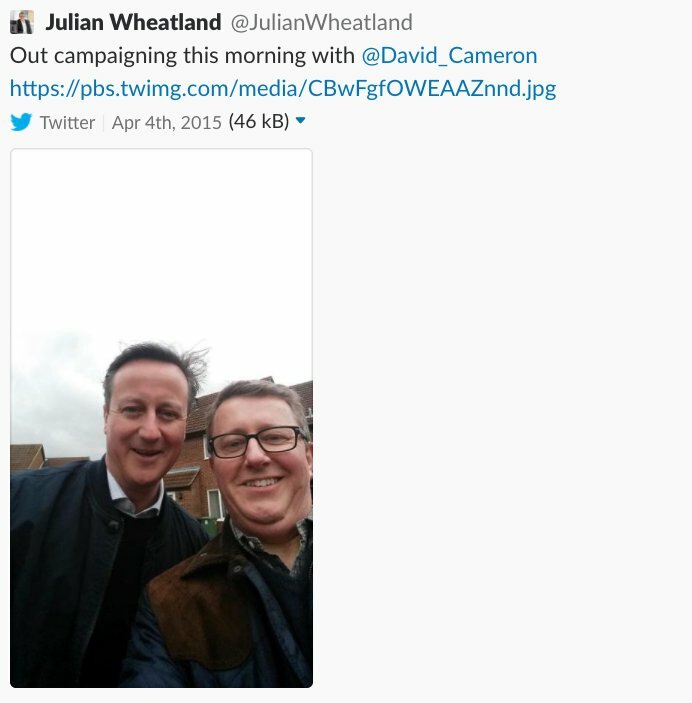 He also posted about campaigning alongside David Cameron in a now deleted tweet (see right). Bella can also now reveal that Wheatland stood unsuccessfully as a Conservative candidate in the 2015 District Council elections in the Vale of White Horse in Oxfordshire. He received 1276 votes but failed to get elected, being beaten by two Liberal Democrat candidates. Conservative Party links aside, Wheatland is far from detached from the running of Cambridge Analytica. He is the current chairman of the parent company SCL Group. As as been outlined by whistleblower Chris Wylie and others, Cambridge Analytica and SCL Group are in effect the same company. They form what Wylie calls a “privatised colonising operation”. One incident particularly highlights just how interconnected the companies are and how wrapped up in it Julian Wheatland is. In March 2017, US professor David Carroll made a subject access request to Cambridge Analytica under the UK data protection act. He duly received a response on Cambridge Analytica headed paper. The signatory? Julian Wheatland. Bear in mind at this point Wheatland was only ever listed as being involved in SCL Group. Meanwhile, Carroll is taking Cambridge Analytica to court in an effort to reclaim his data. Meanwhile, Companies House records also show Wheatland registered a company a company called Emerdata last August. Alongside Wheatland and Nix, board members of the company include Robert and Rebekah Mercer, who help to fund Cambridge Analytica’s activities in the United States. They are joined on the board by businessman Johnson Chun Shun Ko, himself a close associate of Erik Prince, founder of private military contractor Blackwater. Wheatland’s links with SCL Group seem to have been initially established through the property tycoon and billionaire Conservative party donor Vincent Tchenguiz. Wheatland is a close associate and former employee of Tchenguiz through his holding company the Consensus Business Group. He was appointed to the board of SCL shortly after Tchenguiz made considerable investments in the company in 2005. Tchenguiz was the leading shareholder in SCL Group for over a decade, and only sold his shares in the company in 2015. That move came just weeks later that Cambridge Analytica made its entry into US politics, initially beginning work on Ted Cruz’s presidential campaign. Incidentally, Tchenguiz won over £1m by betting on the outcome of the US election and more recently placed a considerable bet on Marine Le Pen’s Front National winning in France. Like Tchenguiz, Wheatland also has considerable business interests in Eastern Europe. He is the Chief Executive and founder of Cosmos Technology, set-up to help Bulgarian technology companies “reach international markets”. Curiously, the website for this company has since been deleted but a cached version of the site can still be reached. The only two partners of the company listed on this version are ISIS Enterprise (now Oxentia), a ‘technology and innovation’ business out of Oxford University and AirBus Helicopters. Airbus are the world’s biggest manufacturer of both civilian and military helicopters. The synergy between technological and military pursuits will be a familiar one for those who have followed the activities of SCL Group. SCL’s signatory to the contract? Julian Wheatland. It is still unclear exactly who SCL are working for in Romania but Imre happens to be the son-in-law of the country’s foreign minister Teodor Melescanu. Meanwhile, SCL’s other other link to Romania is through Dan Mursean. He was Chris Wylie’s predecessor and the son of another Romanian government minister, who was found dead in a Kenyan Hotel room in apparently suspicious circumstances. Romanian journalist Sorina Matei has been investigating this story and published a number of articles about SCL’s operations in the country. She told Bella Caledonia: “I understand Julian Wheatland signs all of the contracts for SCL. Peter Imrie is the Head of SCL Romania and in a recorded phone call he confirmed to me that SCL and Cambridge Analytica are the same thing. Wheatland is less flashy than Nix and less obviously machiavellian than SCL’s founder Nigel Oakes. Nevertheless, he is someone who, for over a decade, has been involved right at the very top of the organisation that has woven an international web of deceit and deception. He has links not just with Vincent Tchenguiz, but with a number of businesses and business people which warrant intense scrutiny. He’s been the person signing the contracts for both SCL Group and Cambridge Analytica on a series of controversial deals. He’s campaigned alongside former Prime Minister David Cameron and stood for election for the Conservative Party. Perhaps it’s time Julian Wheatland was also be invited to answer questions in front of MPs in Westminster. This type of reporting is what Bella is for. It is why this site is so, so valuable. What is revealed is that the great corruption runs through the British establishment like a sewer. It is like a huge algae bloom that chokes the life out of democracy. Earlier reports from journalists looking at this before this year’s breaking scandal, identified other players including Michael Flynn, who resigned (or ‘terminated involvement’) shortly after Trump won, mission accomplished. Flynn clashed many times with Obama administration officials over his management of the Defense Intelligence Agency — was fired, leaked emails from amomng others Colin Powell, suggest, for many things including bullying, personal crusades etc, and like many other former generals transformed his intelligence career into a lucrative business advising cybersecurity firms and other government contractors. Including the usual roster of scumbag clients, all around the world, I’d recommend looking at what Flynn has been working on, and who he has been working with. No surprise to find him working for SCL Group too, then. So many of these military contractors seem to be trying to do through private business what they failed to do in government. It would be interesting to learn how firms like SCL compete or cooperate with similar organizations. If individuals leave one company to join another, taking data, trade secrets and clients with them, as happens in other sectors. How they share information. How secure their own data arrangements are. I guess you would find a different pattern of behaviour (in recruitment, who they collaborated with, ideology of clients, how they deal with leaks or ‘traitors’) in organizations which were effectively arms of state or party compared with free-market or entrepreneurial organized-crime outfits. I wonder how close fiction has got to describing this shadow world. There’s a private military contractor, a villain called Prince, in Pat Mill’s violent series Greysuit (drawn by John Higgins) in 2000AD, where a British state elite assassin breaks his advanced conditioning process and wreaks havoc on the secret old-school-tie networks running the country. Whether you are an agent of state or free-lance subcontractor, I imagine assurances (of legal immunity or at least a pay off) are usually not enough, and the classic fictional resort (exemplified in Fox’s Deep State) is to keep damaging secrets as insurance. The old British establishment culture of personal loyalty hierarchies may no longer be enough even to paper over the cracks, so what is holding these secretive organizations together when there may be inducements to blab? Perhaps, sadly, the mainstream news is seldom willing to publish (like First Dog on the Moon claims about Australian live animal exports). Or as the article mentions, the inducements not to blab include being found dead in your hotel room otherwise.